Something tells me I succumbed to the temptation last time around as well, but with all these retrospectives flying around, it's hard to resist getting involved. The secondary reasoning is that I'm coming to the end of another squad for my Imperial Fists, and I'm really reckoning it's time to start something else at 54mm - some feedback will inspire me to get myself in gear, I hope! Apologies that some of the photos are a bit small - I must have messed around with the photo settings at some point. 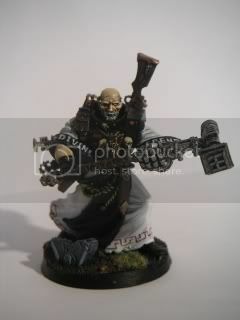 Inquisitor Herodotus Benedict Saussure, Ordo Hereticus Terran, Guardian of the Conclave was my first non-standard Inquisitor model, and I still enjoy gaming with him today. 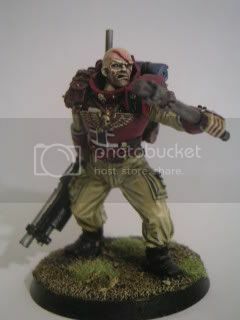 Inquisitor Goddard and he have recently been clashing in Dark Magenta battle reports. 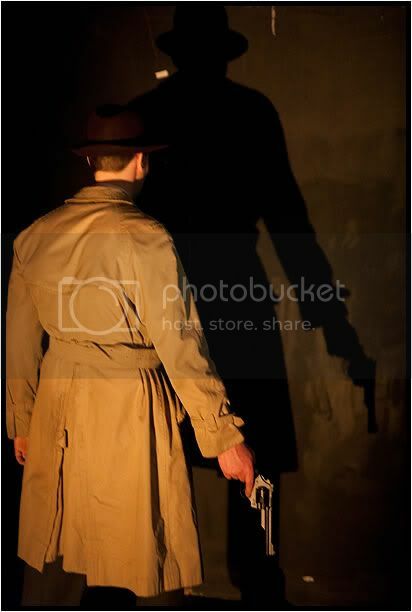 Accompanying Saussy is his ever-loyal Interrogator, Richard Kuerten. 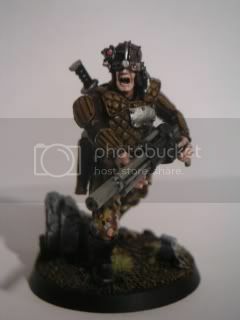 Unfortunately, he was painted in something of a hurry and I've never been happy as happy with him as the others. Maybe I'll re-model Richard one day in the future? 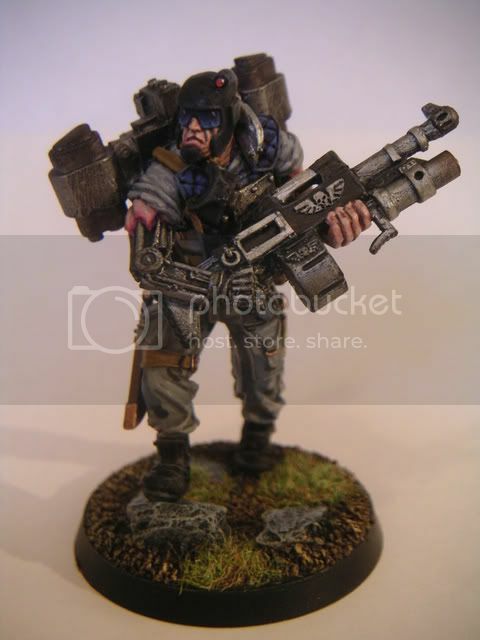 First Sergeant Ernst Asimov, permanently seconded to duties under the Holy Ordos. The arco-flagellant Deus XVII, Saussure's terror-weapon of last resort. Before I moved onto a new warband, I took time-out to paint the gorgeous, gorgeous Eldar Ranger figure, which is still a favourite feature of the model range. 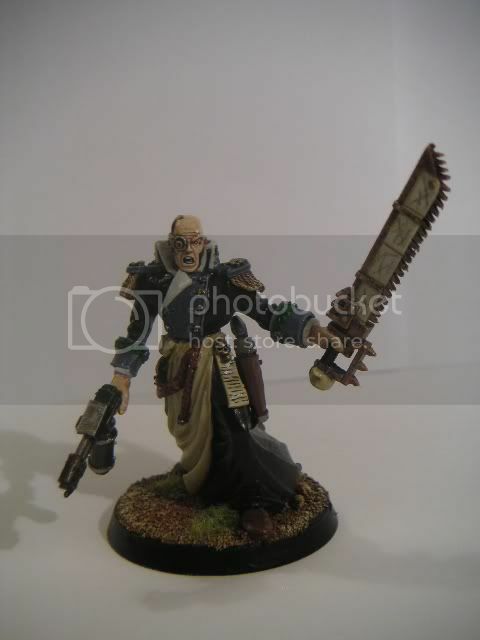 Then I launched myself into my newer, and slowly-growing, warband, the head of which is Inquisitor (or Interrogator) Nathaniel Carter, my young Inquisitor who was raised to a full member of the Ordos after completing his training under the watchful eye of Saussure. 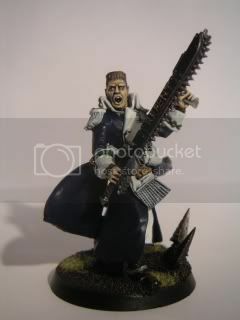 Not held in a position of trust by his new master, Sanctioned Psyker Vasa Sark is nonetheless accepted as being a useful, if unsavoury, servant of the Inquisition by Carter. 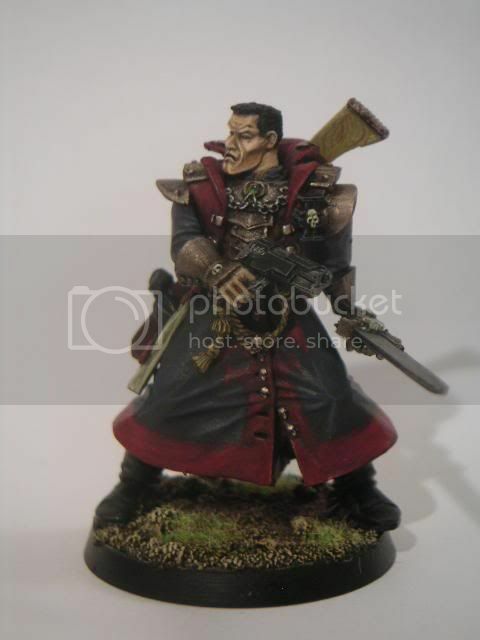 Reflecting his strong ties to the Imperial faith as his moral beaon, Carter is accompanied by Serghar Kasl, Inquisitorial Black Priest. After I finsihed the initial four, I had a break from 54mm modelling, and I got myself back into the swing of things with a model most people don't seem to like, the Eversor Assassin. 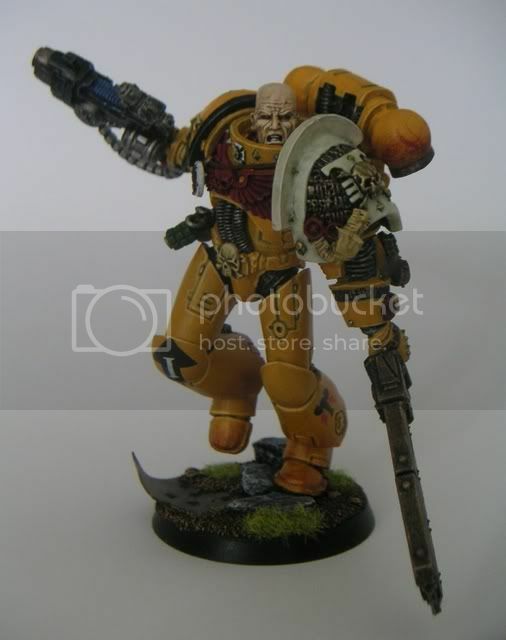 And then, in what was a major - yet massively satisfying - project documented on the last 'Clave, I tackled Brother-Sergeant Tybalt Andrus, Fifth Company, Imperial Fists Chapter, Adeptus Astartes. I was back with the bug now, and added the last two (current) members of Carter's warband, though I'm ashamed to say that I've not gamed with either of them yet so, if I had ever thought of names for them, they've faded into the back of my memory. First up came my Drop Trooper, put together with kind support from Conclave members offering the odd important piece or two (cheers, Nick and Tim!). And finally, Carter's aged mentor, who has been tempted back into active Inquisitorial service to pass on his wealth of experience to Nathaniel. I wanted the look of an aged gentleman when I put him together. So, there we go, one and all - not the biggest collection going, but I'm so painfully slow with a brush these days that it's never going to be! I have plenty of detail shots available if anyone wants to see any more angles of any particular pieces? That is a fantastic collection, but the highlight for me has to be Nathaniel Carter. The painting on that model is just fantastic, mainly because, as well as it being a great colour scheme, it has so many different textures - wood, metals, skin, cloth etc. I'm also hugely envious of your ability to paint faces - I can do them well sometimes, but yours are consistently excellent. Very nice. Perhaps you could run a conclave competition/poll to name your two models? 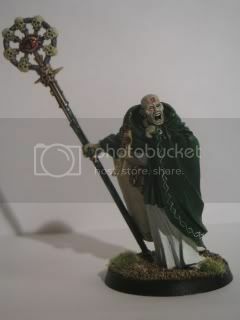 Liking the very un-subtle staff on that psyker. No wonder he isn't getting along well with the other kids. Hey, I remember that Ranger, isn't that the same one mentioned in Summoning the Muse article? I have to say, my favourites out of these are the Ranger and Inquisitor Carter. Brilliant retrospective, Derek. The piece d'resistance for me is your Imperial Fist. Gob-smackingly good. Fantastic selection of figures. All of them have had a brilliant amount of time and effort spent on getting them just right. 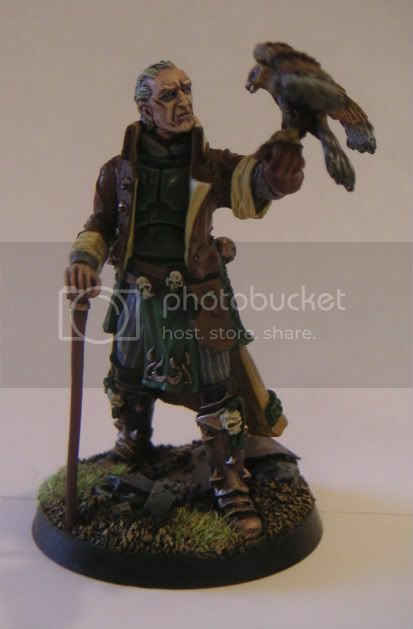 I do like Carter, he's nicely painted and the conversion work is subtle, but I have to say that my favourite character piece of yours is his mentor with the eagle, I think its absolutely awesome. Subdued but powerful I'd say. I also love Mikael Durant, but then I always had a penchant for the thuggish head from the bodyguard. 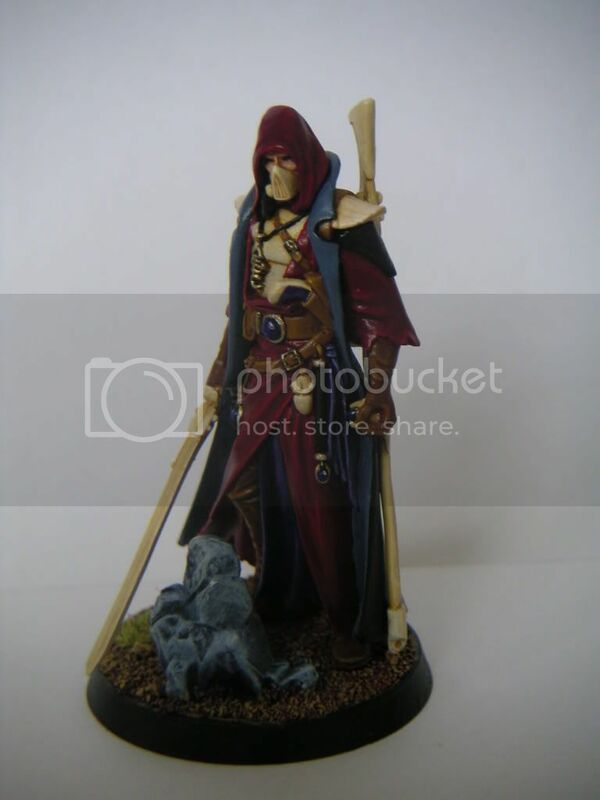 Not to be negative to the rest of your models, but the old mentor blows the rest out of the water. 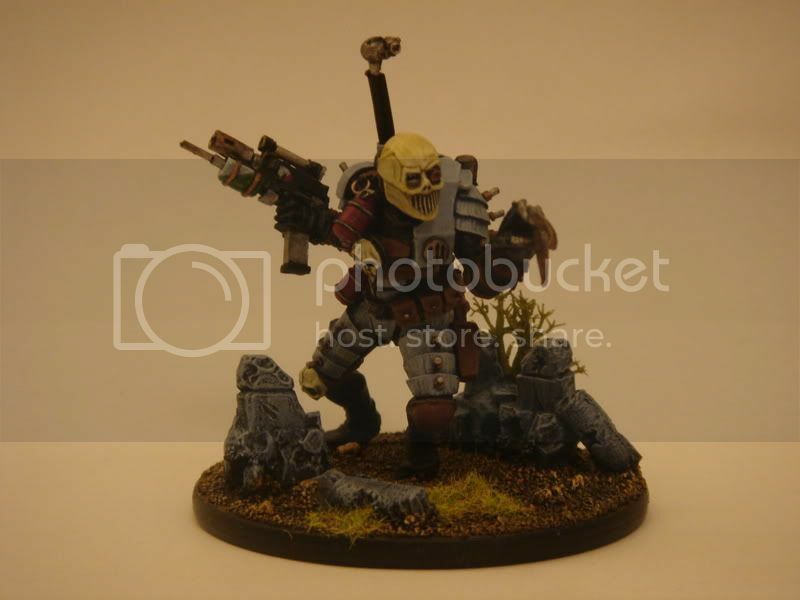 Great concept and very well executed conversion and paint job on that guy. 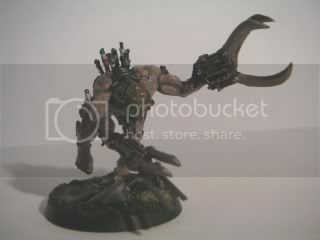 It's that kind of model that makes me think I should start working in 54mm again. I'm pleased that people like the Mentor - I wanted to go for a character who looked less like he was in combat than my other characters. 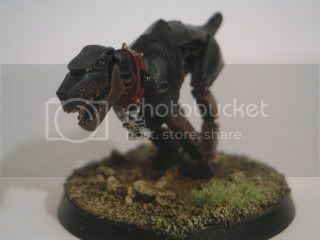 I felt it emphasised the role I saw him playing in the dynamic of Carter's warband.